This pork rind crusted bacon recipe is a zero carb way of eating extra crunchy bacon! 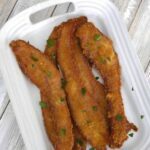 LCHF, gluten free and keto recipe. A few months ago I used crushed pork rinds to crust pork tenderloin instead of using panko or regular breadcrumbs. This is a very similar idea (but using a different part of the pig!) 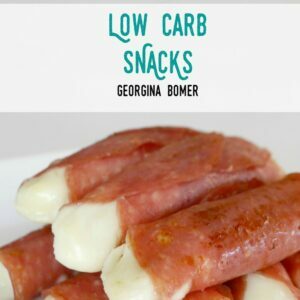 and makes a super tasty low carb snack. Place about one cup of pork rinds into a sealable bag and crush them into breadcrumbs with a meat tenderizer or similar. This is actually quite therapeutic! Update! 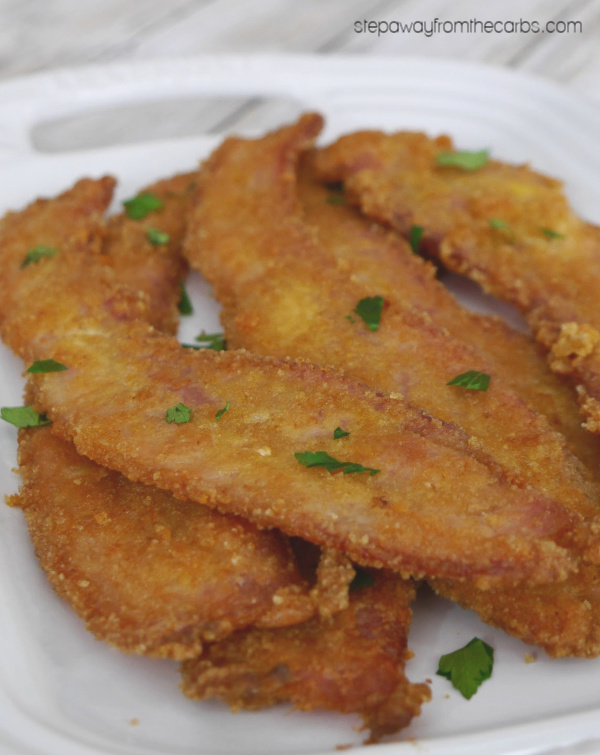 I now use Pork Rind Crumbs for this recipe! It’s definitely the lazy route – but they are SO convenient and super finely ground. Then set up a dipping and coating station. 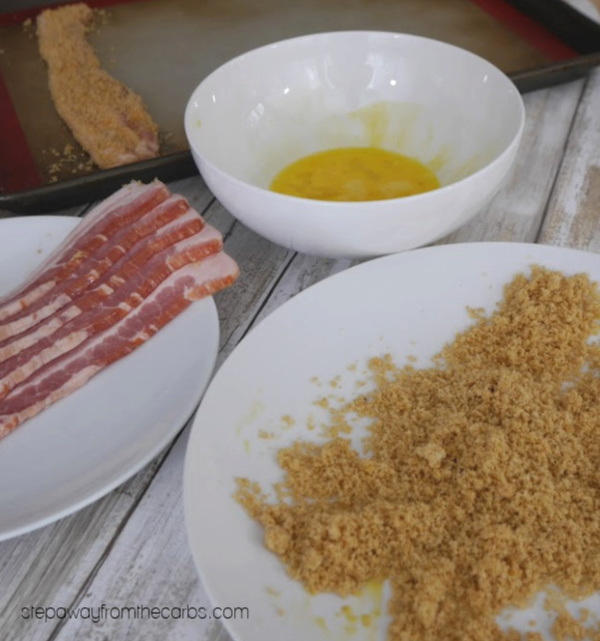 Thick cut bacon, a beaten egg, and then the pork rind crumbs. Dip the bacon in the egg, then in the pork rinds. I usually cook six rashers of bacon at a time for this recipe. Place on a baking sheet lined with a silicone mat. You could either broil the bacon or roast the bacon. I’ve tried both and broiling is faster but is harder to keep the pork rinds from burning while waiting for the bacon to get crispy. Roasting makes it easier to balance the crust with the bacon, but takes longer – but is probably my preference. Either way, you’ll want to start on a silicone mat until the crust is completely adhered, then move the bacon onto a rack set over the baking sheet to crisp it up. 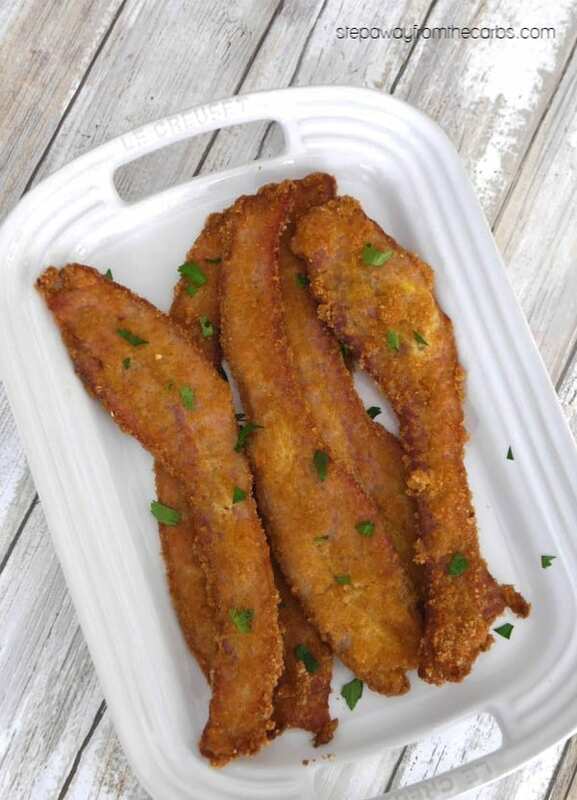 You might need to try it several times to get the crispiness of the bacon to your liking. But hey, it’s not exactly a hardship to keep trying this recipe as the bacon tastes great whatever! Set up a dipping and coating station. Bacon, the beaten egg, and then the pork rind crumbs. Dip the bacon in the egg, then in the pork rinds. 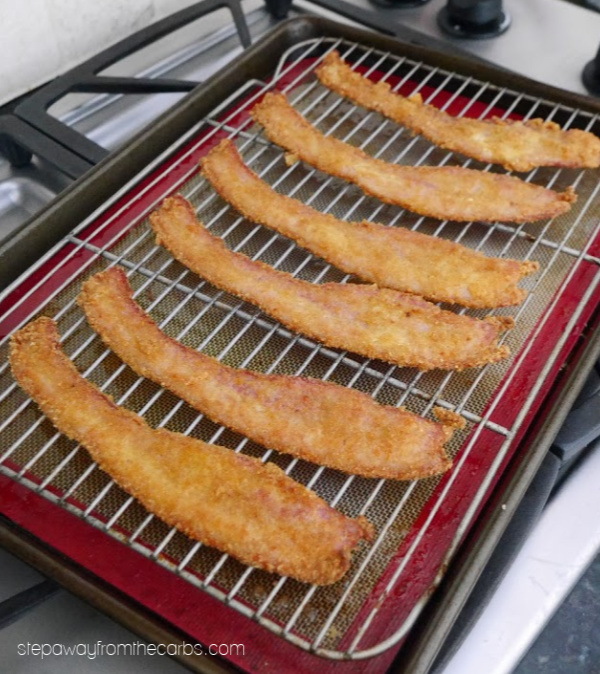 Place the coated bacon slices on a baking sheet lined with a silicone mat. Roast for 10 minutes, turning half way through the cooking time. Transfer the bacon to a wire rack set over the baking sheet, and cook for a further 5-10 minutes until the bacon is cooked to your liking. 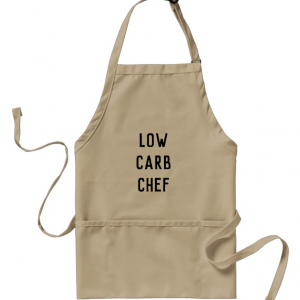 If you love pork rinds, check out these 16 low carb ways to use them!